If you’re familiar with yurbuds, then you are already aware that they are the sport earphones gauranteed to never hurt or fall out. Now the company’s announced a new line especially for women called Inspire for Women. Athletes and those who listen to music while working out are big fans of yurbuds and this new option is meant to appeal specifically to women in both fit and style. They come in six colors and are shaped to fit snugly but comfortably in the ear. The Inspire for Women yurbuds are available in Target stores exclusively. 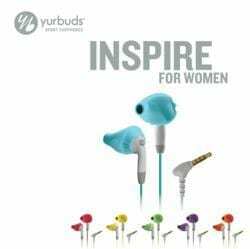 Yurbuds was an official sponsor of the Nike Women’s Marathon in San Francisco this year where they received accolades from the runner who used them. Yurbuds are made to stay in your ear and deliver premium sound even while moving. They are sweat proof, water resistant, and don’t block out ambient noise. For anyone who jogs, rides a bicycle, or works out in the outdoors, this is a great choice. If you haven’t tried them, you definitely should. They work with any audio device that has a standard audio jack (iPhone, iPod, most MP3 players, etc).